in the family Phoenicopteridae. There are four flamingo species in the Americas and two species in the Old World. High Andes in Peru, Chile, Bolivia and Argentina. Flamingos often stand on one leg, the other tucked beneath the body. The reason for this behavior is not fully understood. from the bottom. Or perhaps they just like to stand onm one leg at a time. or pale flamingo, however, is usually unhealthy or malnourished. proteins in their diet of animal and plant plankton. These proteins are broken down into pigments by liver enzymes. in color compared to those who get it second hand (e.g. from animals that have digested blue-green algae). Zoo-fed flamingos, who often lack the color enhancer in their diet, may be given food with the additive canthaxanthin. 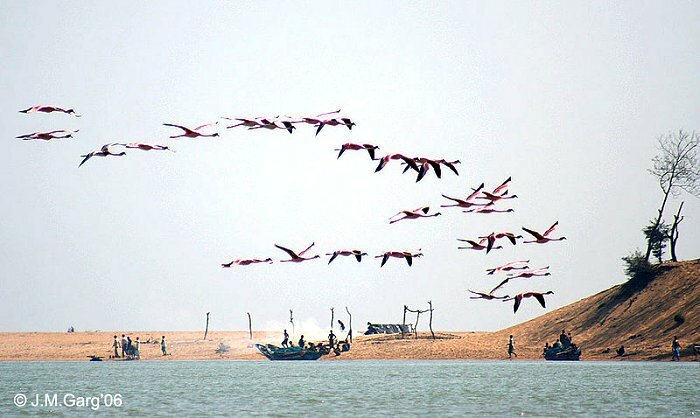 Lesser Flamingo Phoenicopterus minor in Chilika, Orissa, India. 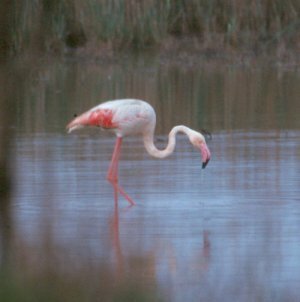 three purposes for the flamingos: predator avoidance, maximizing food intake, and exploiting scarce suitable nesting sites. occur. In pair bonds, both the male and the female contribute to building the nest for their egg and defending it. Flamingos will viciously defend their nesting sites and young. After the chicks hatch, the only parental expense is feeding. Flamingos produce a crop milk, like pigeons and doves, due to the action of a hormone called prolactin (see Columbidae). stay in their crèches are vulnerable to predators. individuals is a matter of some debate. A single bird was seen on North Keeling Island (Cocos (Keeling) Islands) in 1988. 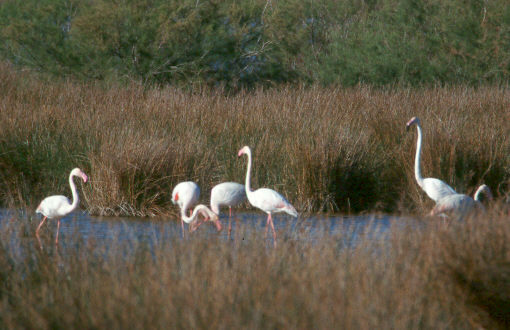 The Greater Flamingo is the state bird of Gujarat, India. primary and secondary flight feathers are black. The bill is pink with a restricted black tip, and the legs are entirely pink. The call is a goose-like honking. Like all flamingos, this species lays a single chalky-white egg on a mud mound. They are usually found in large colonies and are partly migratory. Lesser Flamingo at Slimbridge Wildfowl and Wetlands Centre, Gloucestershire, England. Taken by Adrian Pingstone in June 2003 and released to the public domain. 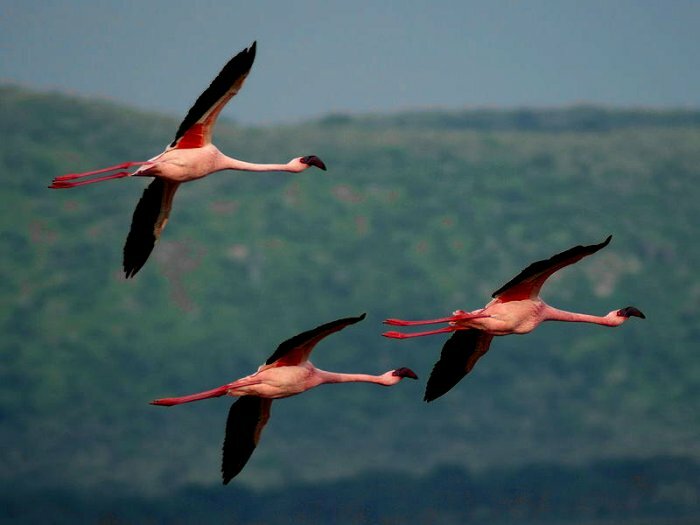 The Lesser Flamingo is the smallest and most numerous flamingo, probably numbering up to two million individual birds. They generally weigh 2.0 kg, are 85cm long, stand in 1 m) tall, and have a wingspan of 1 m). of each species also differ in height. contain the photosynthetic pigments that give the birds their pink colour. Their deep bill is specialised for filtering tiny food items. The lesser flamingo also feeds on shrimp. 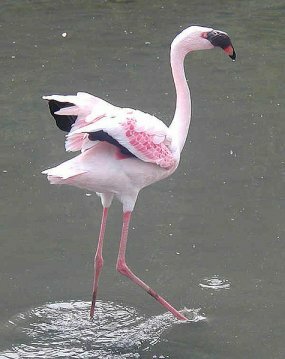 Lesser Flamingos are prey to a variety of species, including Marabou Storks, Baboons, African Fish Eagles and Wildcats. was unsuitable due to flooding. 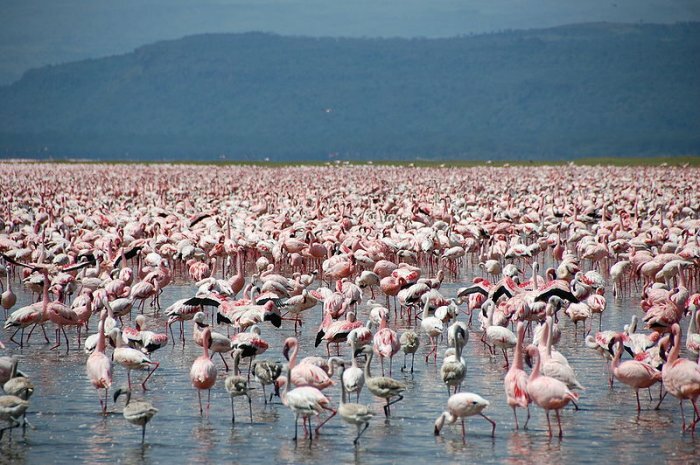 In the early 20th century breeding was also observed at Lake Nakuru. at the Zinzuwadia and Purabcheria salt pans in north-western India. foot to fresh water, a journey that can reach over 32 km.